This report provides a new perspective to the nature of urban sprawl and its causes and environmental, social and economic consequences. This perspective, which is based on the multi-dimensionality of urban sprawl, sets the foundations for the construction of new indicators to measure the various facets of urban sprawl. The report uses new datasets to compute these indicators for more than 1100 urban areas in 29 OECD countries over the period 1990-2014. 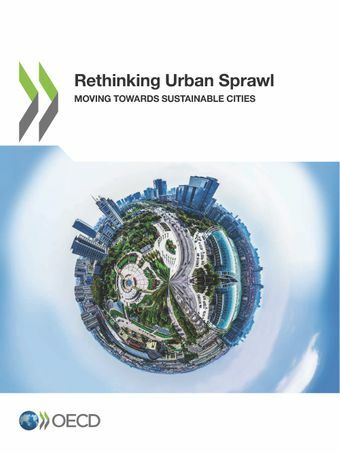 It then relies on cross-city, country-level and cross-country analyses of these indicators to provide insights into the current situation and evolution of urban sprawl in OECD cities. In addition, the report offers a critical assessment of the causes and consequences of urban sprawl and discusses policy options to steer urban development to more environmentally sustainable forms. As the world’s cities are growing, urban sprawl is getting worse. An new OECD study of 1,100 cities shows 60% of space is now low-density. This erratic city growth is damaging the environment. What can policy makers and governments do to move towards more sustainable cities? ‌Cities are home to more than half of the world’s population and are the engines of economic growth and employment. However, cities also face major environmental, economic and social challenges, many of which are associated with the fact that urban development has occurred. Urban sprawl, a particular form of development, is often cited as a driver of several of these challenges, including greenhouse gas emissions, air pollution, road congestion and lack of affordable housing. What exactly is urban sprawl and how can it be measured? Are cities in OECD countries sprawling and how is this impacting the environment? On 14 June, Walid Oueslati and Ioannis Tikoudis of the OECD Environment Directorate discussed the state, evolution and implications of urban sprawl, and policy actions to incentivise greener urban development patterns. Watch the video recording. To receive our Environment and Chemical Safety and Biosafety news, publications and events, sign up to MyOECD (choose "Environment" and "Chemical Safety and Biosafety" as an area of interest and tick "Environment News" and "Chemical Safety and Biosafety" under Newsletters).